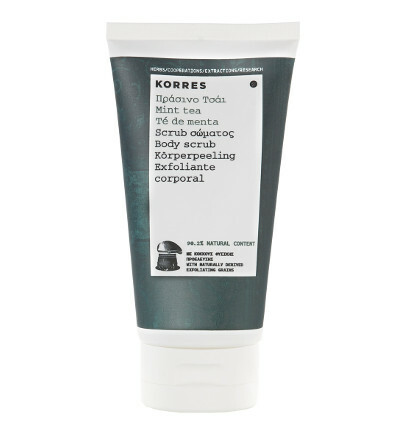 Mint fresh cleansing body scrub, carrying the Mint Tea scent of the Greek skincare brand’s best-selling body collection. The combination of ground Bamboo with Jojoba beads in all three scrubs effectively removes dead cells and improves microcirculation. The multimineral combination of Sodium, Magnesium, Zinc and Manganese works to restore the skin cells’ energy and hydrate. Use Apply on wet skin and massage in circular motion. Rinse thoroughly. Use 1- 2 times weekly. Aqua/ Water/ Eau, Sodium Laureth Sulfate, Bambusa Arundinacea Stem Powder, Helianthus Annuus (Sun­ower) Seed Oil, Cetearyl Alcohol, Cocamidopropyl Betaine, Jojoba Esters, Parfum (Fragrance), Acrylates/ C10-30 Alkyl Acrylate Crosspolymer, Althaea O‑cinalis Root Extract, Arginine, Butylphenyl Methylpropional, Cetearyl Glucoside, Citronellol, Helichrysum Arenarium Flower Extract, Hexyl Cinnamal, Iron Oxides, Lactic Acid, Limonene, Linalool, Lonicera Caprifolium (Honeysuckle) Flower Extract, Lonicera Japonica (Honeysuckle) Flower Extract, Magnesium PCA, Manganese PCA, Sodium PCA, Sodium Phytate, Xanthan Gum, Zinc PCA.